Isaiah 10:27 (AMP): So it will be in that day, that the burden of the Assyrian will be removed from your shoulders and his yoke from your neck. The yoke will be BROKEN BECAUSE OF THE FAT. The anointing of God upon our lives has degrees and each of us functions according to the degree of that anointing that is at work within us. Our theme scripture describes this as FATNESS and the yoke is broken because of the fat. Imagine a yoke tied around the neck of an animal. If that animal fattens and increases in size, it means that the yoke can no longer hold it. So it is with the believer. As you continue to yield to God and allow Him to work through you, you get to a point where certain yokes simply start to break off because they can no longer hold you. As you grow, the fatness of the oil cannot allow certain yokes. It doesn’t matter whether your family has a history of bareness; of terminal illness or of poverty. Simply stir up the anointing, deliverance will come. Stir up the anointing, change will come. Understand the anointing, you will stand before kings. The yoke is broken BECAUSE of the fatness. Hallelujah! 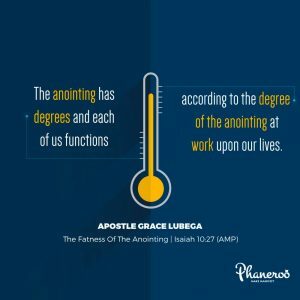 The anointing has degrees and each of us functions according to the degree of the anointing at work upon our lives. PRAYER: My loving father, I am thankful for this Word. I grow in the anointing and also increase the anointing upon my life. I thank you because of the transformation in my life as I continue to yield to your power. In Jesus’ name. Amen.